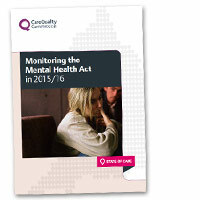 Monitoring the Mental Health Act in 2015/16, our annual report on the use of the Mental Health Act (MHA), looks at how providers are caring for patients, and whether patient’s rights are being protected. 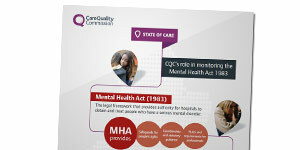 There are 57 NHS trusts and 161 independent hospitals that provide mental health care for people under the MHA in England. During 2015/16, we carried out 1,349 monitoring visits, and met with 4,282 patients. Detention rates have continued to rise in recent years, and 2014/15 saw the highest ever year-on-year rise (10%) to 58,400 detentions. Throughout our monitoring visits and inspections, we saw many examples of good practice. However, good care is not consistent across the country. For 12% (515 out of 4,344) of patients interviewed on our visits in 2015/16, there was no evidence that they were informed of their right to an Independent Mental Health Advocate (IMHA). There was no evidence of patient involvement in care planning in 29% (1,214 out of 4,226) of records that we examined. Similarly, 10% (452 out of 4,407) of care plans showed that patients’ needs had not been considered. Download our infographic using the link below. Overall, we required more than 6,800 actions from providers to improve practice as a result of our monitoring visits. Providers must demonstrate stronger leadership making sure they can train and support their staff on the revised Code of Practice and how patients should be involved in their care from admission and onwards. Commissioners should consider how to ensure the best approach to commissioning, procuring and delivering services locally that is based on the needs of people who use services. The Department of Health and national agencies should work together to focus on early intervention to reduce detention rates. The experiences and views of detained patients should be a routine part of local MHA monitoring. Press release: Faster improvements needed in how people are cared for when detained under the Mental Health Act. Report: State of Care 2015/16. Report: National Preventative Mechanism 'monitoring places of detention'. We publish two main types of information for care providers: our provider handbooks and guidance on meeting regulations. By using our Provider Portal, you'll be able to send us statutory notifications and make changes to your registration quickly and easily.